The 61st Annual Tallman Arts Festival will take place on Sunday, Aug. 5 from 10 a.m. to 4 p.m., at the RCHS campus. Brandon and Hiedi Kadlec opened their hearts when they decided to become adoptive parents and they opened them even further when they agreed to take in a baby with a rare heart condition. 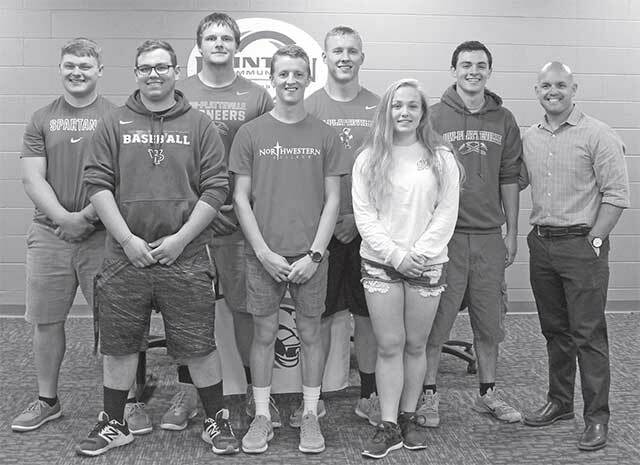 SUBMITTED PHOTO The Clinton Topper Clinton’s Senior Athletes signed Letters of Intent to play at the collegiate level last week. Pictured here is Clayton Hahn, Jordan Hendricks, Kenny Ballmer, Brice Enright, Zach Krause, Clara Lund, Connor Mullooly and Jeff Spiwak. The Wisconsin Elections Commission approved ballot status for the fall 2018 election for state Rep. Amy Loudenbeck (R-Clinton) after she submitted in excess of the required 200 nominating signatures and her Declaration of Candidacy form earlier this week. On April 17, 2018 the FBI Safe Streets Task Force, the Rock County Sheriff’s Office Special Investigations Unit, the Winnebago County Sheriff’s Office Narcotics Unit and the Beloit Police Department’s Violent Crime Interdiction Team served two search warrants.